We finally made it to Legoland! 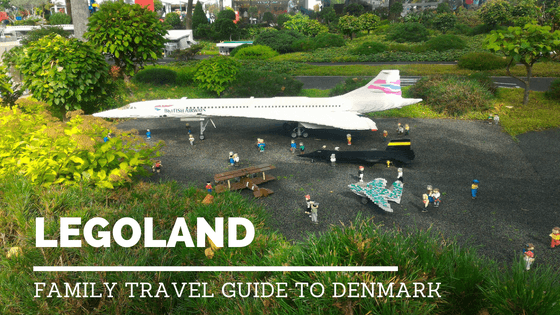 After spending years playing with legos, idealizing houses, cars, people, animals, planes and imaginary worlds … we were now in Billund, where it all started in 1935. The word Lego comes from the Danish words “leg” and “godt” which means “to play well.” The concept of this toy is to combine pieces, forming different structures, stimulating concentration and creativity. It was created by a carpenter from Billund, Ole Kirk Christiansen, who created these pieces (first made of wood and later of plastic) to offer toys to his son. Europe’s leading Lego factory is located in Billund, and produces around 72 million pieces daily! Here you can also discover the amazing Legoland Hotel and Legoland Theme Park. This 4 star hotel has needs no introduction. It is the official Lego Brand Hotel and has a private entrance to the theme park. All the decor of the hotel is breathtaking, with details and surprises around every corner. It was difficult to concentrate on the explanations given in the reception, since the 5750 mini-figurines of Lego exposed there, immediately caught our attention. Between sighs of enthusiasm at every nook and corner, we finaly arrived at our hotel bedroom. Needless to say, that races in the corridors of the hotel were inevitable and the entrance into the room left our legs shaking. Not to mention the surprise of having 2 huge boxes of lego under the bed and so many details made in Lego inside the bedroom. We stayed in the “Kingdom” themed room with fire dragons, royal swords and coats of arms. There are many other themed rooms of pirates, princesses, adventure heroes or LEGO® Friends. Our room had a bathroom with shower, free wi-fi, 2 TV’s, a bunk bed, a double bed and a large window overlooking a lawn. The atmosphere inside the Hotel was very relaxed, colorful and vibrant. The children had lots of entertainment, including pools of lego scattered around various corners (restaurant included), where no one could resist to “diving” in … Creativity was awarded daily, all you had to do was to display your daily creation on a specific shelf. The next morning, the winners were announced. In the Hotel there was also a games room ( with Wii games, billiards and table football), a playground, a shop and various activities. Hotel guests had access not only to the Legoland Theme Park (tickets purchased separately or included in the package of the stay) but also to Lalandia, which is located about 10 minutes walk from the hotel. Prices: A one night stay at the Legoland Hotel for 4 persons (children up to 3 years old do not pay) + buffet breakfast + 2 consecutive days entrance at Legoland Park may cost (depending on the age of the persons and the type of room) 500 euros (3.800 DKK). The buffet dinner costs DKK 118 (€ 15) per child (3 – 12 years) and DKK 248 (€ 33) per adult. It was good, varied and there were several schedules to choose from, to avoid the queues. Legoland Theme Park is closed from November to March. Make your reservation here. How was the Legoland Theme Park like? In this park there are more than 60 million pieces of LEGO …. Aqualand Lalandia is the largest water park in Scandinavia with 10,000 m2. It is covered and has a great variety of water activities from wave pools, swimming pools with obstacles where you can try to “walk on water” or play with rubber dolphins or even play waterbasketball. There are also huge water slides (including the “Tornado” and the “Octopus Racers”), a lazy river, saunas, spa and hot tubs. The curious thing is that water in the pools is about 28 ° C and the air temperature is 30 ° C.! So it feels very comfortable inside the water park. Around the theme park there are lots of restaurants, shops, a good supermarket and activities like trampolines, bowling, mini-golf and various game machines. At Lalandia Winter World, visitors have access to a winter sports village such as a ski slope, a climbing wall and an ice skating rink. For babies there are also cots that can be rented on site. Many thanks to VisitDenmark for all the support in organizing this trip! A opção mais confortável é o avião. A viagem demora cerca de 50 minutos e há voos diretos da SAS. Outras soluções são alugar um carro no aeroporto, ou o comboio (estação no aeroporto) mas conte com uma viagem longa de comboio… Há que poderar se o desconforto/ preço compensa ou não, depende do preço dos voos na altura da sua viagem. Vamos a Billund no próximo ano. Ficamos dois dias e achamos suficiente. É preciso comprar bilhetes para ir a lalandia ou a entrada esta incluida na estadia? obrigada. Olá Cláudia, o nosso pacote incluía a estadia no hotel, a entrada na Legoland e no Lalandia.